The Portland area’s three major transportation agencies are prepared for snow and ice, and advised the public Friday on the best ways to prepare for winter conditions. TriMet, the Oregon Department of Transportation and the Portland Bureau of Transportation have been coordinating their efforts and planning for winter conditions since October. Maintenance managers have met with meteorologists to discuss the weather outlook for the season. The three agencies also monitor weather conditions around the clock, check trouble spots and adjust operations as conditions warrant. Suzanne Kahn, maintenance group manager for the city’s transportation bureau, said the city applies a liquid deicer, prioritizing known hazard areas, such as bridges and overpasses and the city’s busiest streets and transit routes. People who live or work in hilly areas need to buy snow chains, practice using them and be ready to use them at any time this winter. Property owners are responsible for clearing sidewalks along their homes or businesses to ensure safe passage for the public. Ted Miller, ODOT’s Portland area maintenance and operations manager, said motorists need to be extra careful when weather deteriorates. Plows and de-icing trucks, he said, need plenty of room to get the job done. So give them a wide berth when you see them on the road. Also, he said, motorists should keep their cars in top condition and remember that patches of ice may remain on the roads even after deicer is applied. 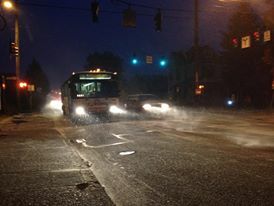 TriMet riders should be prepared for delays and dress warmly, as buses travel at slower speeds during a winter storm. TriMet now has more than 200 buses with automatic drop down chains to provide traction when needed at the press of a button, similar to school buses. This is in addition to regular chains that can be added to buses for traction.